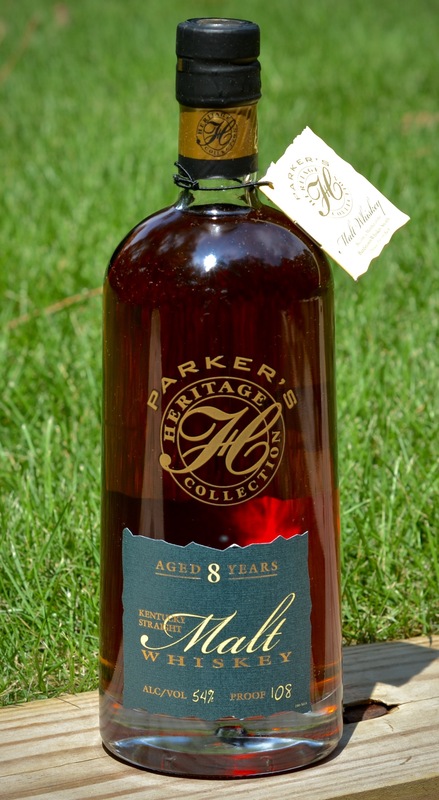 Last year, when Heaven Hill’s Parker’s Heritage Collection release came out, I characterized their annual offering as “like a box of boozy chocolate… you never know what you’re gonna get.” Indeed, last year’s version was a wheat whiskey – a fabulous, awesome wheat whiskey – and the years before that saw a “lovely selection of ten year old bourbon… an 11 year old cask strength small batch… a 27 ! year old… a cognac-finished… you get the idea. Box of chocolates.” This year, the ninth version of the collection, we get a Kentucky malt whiskey. A KENTUCKY malt whiskey? When you read that, you’re probably thinking that would be the one piece of chocolate that bourbon fans would eye warily in the box – the piece that lingers long after the other chocolates have been eagerly snapped up. Malt whiskey is something that they do very well over in Scotland, and even in Japan, but good old Kentucky? There are a growing number of American malt whiskeys, especially of the craft variety – Stranahan’s is a great example, and other notables include Westland, Cut Spike, Balcones, Hillrock, St. George, Hudson, and Corsair. But Kentucky distillers? They’ve mainly stuck to bourbon and rye. This year’s Parker’s Heritage release started with an experimental run of 141 barrels of whiskey that master distiller Craig Beam put up in November 2006 – at 65% malted barley and 35% corn. It sat for a bit over eight years in new charred oak barrels (on the relatively high 5th and 7th floors of Heaven Hill’s Rickhouse Y for all you barrel geeks) before being bottled at 108 proof, with no chill filtering. Co-master distiller Denny Potter noted that Heaven Hill has “always prided ourselves on the high percentage of barley malt in our straight bourbons and ryes” – so there is a reason they decided to try out a more malt-centric whiskey so many years ago. Dark amber color, actually looking a good bit like maple syrup. It will get a bit cloudy (and lighter amber) with ice. The nose is fairly mellow, subdued. You certainly get a bit of the wood influence from those eight years in the barrel, with faint cedar, maybe even a bit of pine, light brown sugar, light leather, a bare trace of vanilla. A touch of water or ice brings out a bit of crisp tangerine peel (not full on orange) and almond, plus a bit of poached pear. Behind it all is a noticeable but not in-your-face grain presence, lightly toasty and warm, a bit oatmeal-like even. Sipping neat, it comes across a touch hot at 108 proof. Toasty/lightly-charred wood notes continue to emerge, as the dry wood elements from the barrel, somewhat sawdusty, are much more prominent here than on the nose. They are certainly more pronounced than the sweet aspects you’d typically get from a bourbon – and the grain notes from the malt still come through here as they do on the nose. A touch of water or ice expectedly smooths it out, brings out a light touch of caramel, and a very faint citrus fruitiness in the background, plus that sweet poached pear again. I still find it to be fairly mellow stuff – without the cinnamon brown sugar punch of Heaven Hill’s bourbons, nor the smoke or salinity most people may associate with Scotch. The finish has a dry heat to it, and a hint of smoke (no peat, I repeat, no peat) – long and slightly bitter, though still pleasant. If you ask me, a cube of ice is the way to go, rather than neat, to get the most out of it. Conceptually, I suppose this delivers exactly what you might expect from an eight year old Kentucky malt whiskey from a talented distiller – you get a balance of the typical Kentucky new char barrel, the grain-forward notes of a malt whiskey, and an overall profile that is a bit hard to pin down versus typical American whiskies. It’s not quite here (Kentucky) nor there (Scotland), but somewhere in the middle – a unique, well-integrated whiskey that doesn’t punch too hard in any direction. For those of you who seek out intriguing whiskies, this is certainly worth trying, and a great example of a big distiller’s take on American malt whiskey to contrast with its craft malt whiskey counterparts.